Today was knitting day. Vera, Mariam, Jean Marie and I……supposedly Mariam was to have the keys to Cristina’s shop, but she didn’t. Cristina has stopped working for awhile till she has the baby (July 4). Cristina’s grandmother, Mariam’s mother lives on the corner. So we went to sit on her porch till the keys arrived. By the time the keys arrived, we were all sitting comfortably around her Grandmother’s table. Lots of Spanglish spoken, but a lot of laughs too. Her grandmother wanted us to stay there because she likes having people around. I feel like part of the family! One thing Jean Marie and I learned today, I feel the need to share. L to R: Vera, Jean Marie, Mariam, 93 year old abuelita of Christina. Disclaimer: Not responsible if you wet your pants laughing! The regular knitting group seemed to keep dwindling down. I was a little bummed and thought maybe it was time to take a break from knitting. 2 weeks ago, I went to a baby shower for Cristina, who was my sewing teacher awhile back. I was the only Gringa there. But it was hilarious. They speak Spanish so fast, just like we speak English fast. I could get a word or two here and there but it was just a super fun time. As usual, I was behind in knitting my gift. I was knitting a small baby blanket and didn’t have it quite done, so I put it unfinished in the gift bag with other things. Tico time is so different. The shower was from 1-4. Of course I got lost getting there and thought I would be really late arriving at 1:30 p.m. Alas! I was the first one to arrive! LOL Others slowly arrived. Altho, people were still arriving at 4:30 and 5:00 p.m. While sitting there waiting for people to arrive, I decided to get the baby blanket and keep knitting on it. Mariam, Christina’s Tia (aunt), came over and watched and we tried to carry on a conversation regarding knitting. She knitted too! 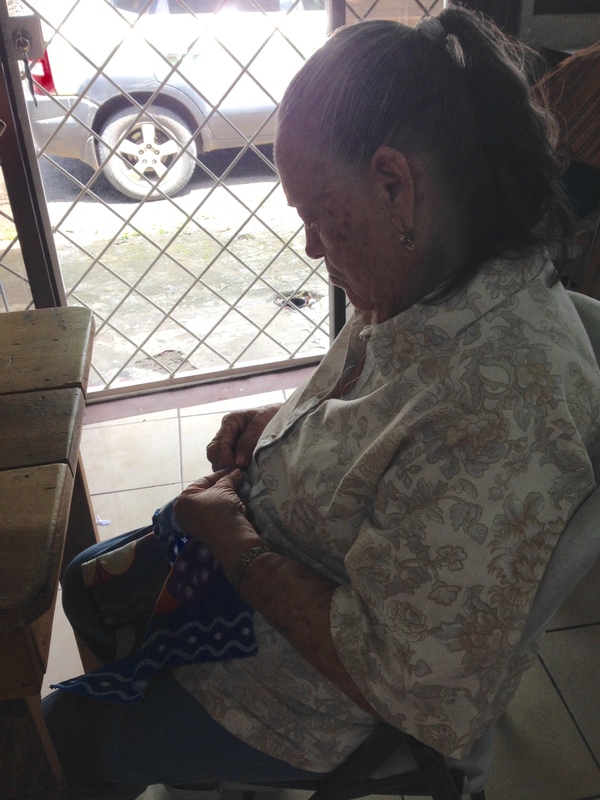 Then Doña Vera (taking quilting classes from Christina) sat down beside me and joined in the conversation. Doña Vera knows some English and it was a little easier to carry on a conversation with Mariam. Christina came over to make sure she wasn’t needed for translating! LOL Cristina said to me “Mariam wants to know if you could get together to knit sometime.” Well, that’s all it took and we became best friends! I suggested first I should take them to Penelope’s in Santa Ana, which is a nice yarn shop! She high fived me on that! Vera wanted to go and Cristina too. So we hit up the yarn shop and a fabric shop. The owner of the fabric shop said no one had ever spent so much time in the store as we did! Where to knit? Decided we would knit at Cristina’s sewing shop and Vera could continue with her quilting. It’s a mix of crafters! We are sitting around a table, knitting, laughing, etc., and all of a sudden the front door opened and in came Cristina’s 93 year old grandmother! She sat down at the table with us and began hand sewing a hem around what looked to me as a napkin. I noticed that every once in awhile a smile came on her face. Am sure she couldn’t keep up with what was being said because most of it was in Spanglish! But she was happy to be with us! And we were happy she was with us. Then Mariam went to Grandmother’s house and came back with 2 quilts that this woman had made. She used fabric from clothes people were throwing away. WOW!!!! Jean Marie and I were really impressed. Gives us a goal to reach 93 and still be active. Can’t wait till the next knitting get together! I left there so happy!!! Sad day – no where near ready for things like this to happen…..
One of my best friends in Bowling Green, KY lost her husband early Halloween morning. Halloween is her favorite holiday and her house is decked out in a “million witches” besides other Halloween decor. Velma’s husband, Jim, was my age…..and I am not ready in my life for friends to start dying. I don’t handle death well. And being in Costa Rica is tough on me because I feel like I need to be there for Velma. However, I was just there 6 weeks ago. I would stay at Velma’s and Jim would pick on me relentlessly! However, me being the Mouth from the South, just dished it right back to him. We had such good times together! I’m sad for Velma, Jason, their son, Denise, their daughter, but most of all Eli and Farrah, his young grandkids. Jim loved going to watch Eli play baseball; I went to one of his games when I was there in Sept. and it was hysterical. (He’s in kindergarten). Farrah is 4 and a young Diva in the making; an absolutely adorable little girl. It should be a rule that God does not take people from mid-October till after the first of the year. For some reason, losing loved ones around the holidays seems to be the worst – probably because of the previous memories and excitement for the new holidays coming. I know this has been devastating for Velma and I feel so sorry for her – we all know we’re going to lose our husbands or wives eventually, but this was just too damn early! Yes, God, I am angry with you – he had lots of things to teach those little grandkids. This is going to be so tough on Velma but I know she can handle it. She keeps telling me she feels lost. I keep telling her it’s baby steps and she’ll get through it. She has many friends and I know they will help her. It’s times like this that it’s tough living so far away….I do call her frequently and we cry and laugh, which is good for her. She started laughing about something we were talking about and then she said, “I’m sorry, I guess I shouldn’t be laughing.” I told her to laugh all she wants…..because we’re laughing about memories and what good are they, if you can’t enjoy them. Today is probably the worst day of her life so far because it’s the funeral. And it will be a military funeral, which is always so touching. Velma we love you and our hearts are broken for you…..you know we’re here if you need us! Love to you and peace to Jim! Fun times with friends in the U.S. Comments Off on Fun times with friends in the U.S. I decided I needed a shopping trip to the U.S. and see some friends! Ate too much, drank too much, laughed too much……but it was great! Pat and Velma were going to pick me up at the airport. Going south on I-65, you take Briley Parkway East. However, they chose Briley Parkway West. Pat said she soon realized it was wrong. Yes, there is a sign with an airplane on it indicating the way to the airport. (Last time they came to pick me up, they got lost too!) I waited and waited……wandered in the baggage claim area and then finally sat outside. Boingo is the WIFI at the airport, and that’s the most pathetic WIFI ever! Takes forever to get on and IF you are lucky to get on you get 3 friggin’ minutes free. Dear Nashville Airport – get free WIFI! So we get to Bowling Green and we’re going down Scottsville Rd. Pat asked Velma if this was the turn to her house. Velma says no and continues talking; as we are almost thru the intersection, Velma says “Oh yes, that’s the turn.” So we cut through the mall to get back on Cave Mill Road. I’m sure all the neighbors were awakened when we arrived at Velma’s! Dragged in the suitcases and immediately went to bed! 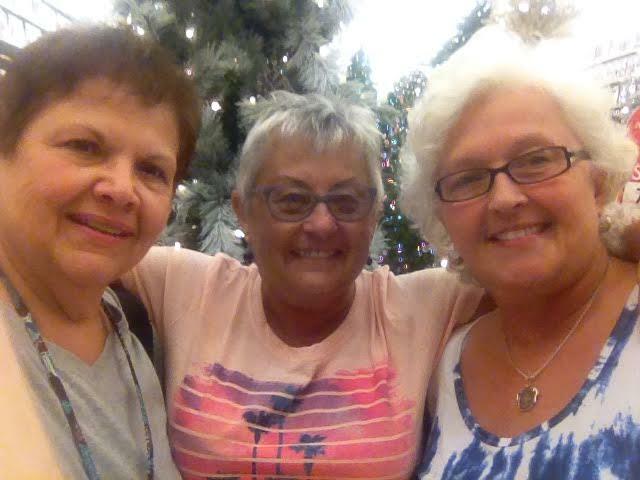 Wednesday we shopped, ate out and went to see the movie Ricki and the Flash. It was the movie with Meryl Streep – very cute; still not as good as Mama Mia! Then we went to the grocery store! I miss U.S. grocery stores! Miss having a deli available. Pat had already seen the movie so she didn’t go with us. But she was coming over for a wine and cheese dinner; the liquor store had a sale 3 bottles for $12 – then the clerk said if you buy one more, it’s a 10% discount; we left with 8 bottles of wine – and there were still some bottles left when I headed for home. and Barnes and Noble. And of course, we ate out! Friday was Knit Day at Corner Bakery – they quit going to Panera’s because the service was so slow. This place was like a Panera’s wannabe – delish sandwiches, etc. Fun to see the old knitting group!!! And I got to meet up with 2 people I used to work with; had to deliver those Freak Flops! After knitting we went to Panera’s to eat because I wanted one of their delicious salads – I didn’t care how slow it was! Back to TJ Maxx because they get a new shipment on Thursday! (and Tuesday) A real shopper knows these things! We went to the movies again to see “No Escape” with Owen Wilson and Pierce Brosnan. It was a good movie but very intense! And to think families are living like this every day. Since it was Labor Day week-end, Kroger was grilling slabs of ribs for $10! Yes, $10!!! And along with other sides if you wanted them. Delish!!! Did I say, they were only $10? Oh, I forgot, we went to Velma’s grandson’s (Eli) “baseball game”. These are 4, 5, and 6 year olds. Some of those 4 year olds are so tiny, they don’t look big enough to be potty trained! It was hilarious! They only play 2 innings, do not keep score and everyone gets to bat. One kid was on third, the batter hit it down the third base line, the runner picks up the ball and runs to home! Another kid crossed home and kept running to first base before going to the dugout. It was funny! Saw another movie “A Walk in the Woods” with Robert Redford and Nick Nolte. Robert Redford decided he needed to do something with his life besides being an author; he left messages for friends to see if they wanted to hike the Appalachian Trail. The only one who would go with him was Nick Nolte, who he did not invite, but heard thru the grapevine he was going to do this. Beautiful scenery and I admit, I missed Costa Rica . It was funny!!!! Coming home, when I would see older men with backpacks on, I just sort of giggled because of some of the antics in the movie! My friend, Joanne, had a water skiing accident on Saturday! Tore the tendon from the bone on the back of her thigh. The ER of the hospital she works in, told her that she would be OK in a week or two! NOT!!!! Her daughter, Brooke, finally got a surgeon that was in her network to see her. She had surgery on Friday and is doing well. Will be a recovery of 5-6 months and she said she’s never water skiing again! Missed seeing some people and I hate that. But there’s only so much time; besides, I’m guessing I’ve been gone long enough, some have forgotten me. Was wonderful to get home and see Mark and of course the dogs went bonkers! It was a great trip! Lots of laughs, lots of food, a great time! Did I say lots of laughs? And lots and lots of shopping! 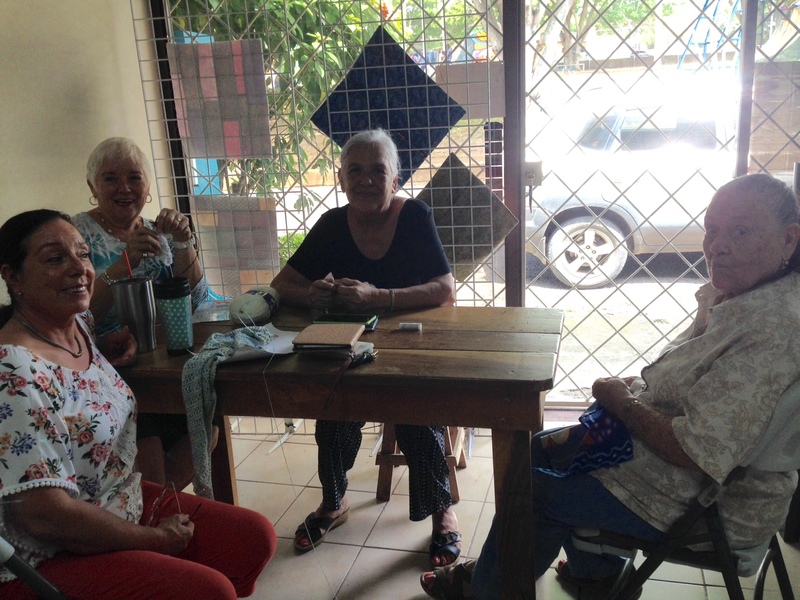 In: Costa Rica | Knitting | knitting friends | misc. stuff | Stupid things I do! Today the knitters met, as we usually do on Tuesdays. We met for lunch at Trapieche in Morazon (and the restaurant is probably spelled wrong). But this is Costa Rica so that is OK. Jean Marie, Harriet, Denise, Bunky and I were there. Food was really good….had a pollo casado and I can’t remember what everyone else had! I put my knitting bag on the ground because the table wasn’t large enough for everyone to do that. While eating, Jean Marie suggested we go back to her house to knit, which was really close to the restaurant. As we sat down around the table, everyone started taking out their knitting. I could have cried!!!! Apparently, the guy serving out food, stepped on my knitting bag and broke two double point needles that I was using to knit socks. I can’t remember ever breaking a needle! Well, I guess that record still holds because technically, I didn’t break the needles! Two of my 6 inch Caspian needles from Knit Picks broken. 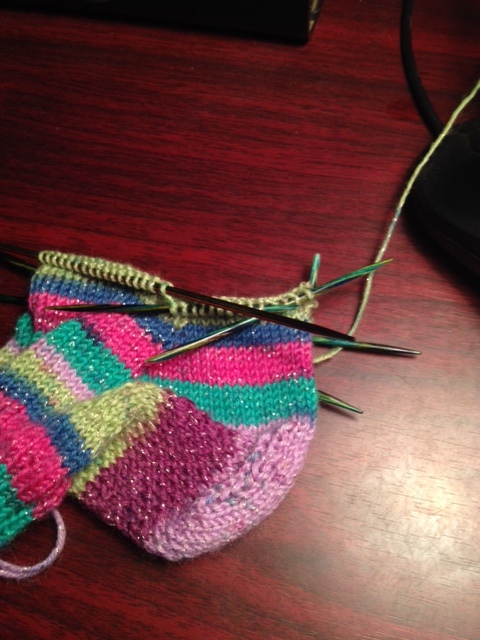 Big sigh…..looking for 2 needles now that are the same size so I can finish this sock. It seems like it’s taking me forever to get this second sock done! I guess next socks I work on, I’ll do two at a time, toe up. At any rate, it was good to get together and knit….well, they knitted, I watched them! We’ve decided to participate in the International Knit in Public Day on June 13th in front of the National Theatre , in San Jose from 9 a.m. – 1 p.m. For sure, Denise and I will be doing this….Jean Marie can’t participate because she’ll be out of the country. Any other knitters that want to join us, please let us know!!!! I remember doing this at Greenwood Mall in Bowling Green, KY when I lived there. Some people brought spinning wheels besides those of us that knitted. It was really interesting to find the older people that would stop and look and start up a conversation…..”I remember my grandmother doing that”……”I remember my mother doing that”…… Of course, this year’s conversations will be in Spanish….this should be a hoot! Tuesday was a busy day! Had Sofi in to the groomer by 9 a.m.; just waited around town running errands, etc. while she had her “day” of beauty. Then I brought her home. Headed back into town for knitting – decided I didn’t want her crawling all over me while I knitted. And believe me, it was a very wise decision! He called our mechanic, Freddy, and he said he would stop at Kay’s to check out the car. However, he neglected to tell Mark that he was headed to Alajuela……At any rate, he stopped by about 3:30 p.m. – poured water in and we watched it run right out. Then he said the magic words…..I told Mark a couple weeks ago, that it would be better to put a new tank/reservoir in – the silicon didn’t hold. By now I’m trying to keep my blood from boiling!!! And it’s a real shame Kay’s doesn’t serve vodka tonics or margaritas! So I calmly asked how much this was going to cost…..75 mil most likely….he immediately called to order the part from San Jose and it will arrive either today or tomorrow by bus….Freddy said it’s a quick job to do. Thru many phone calls back and forth with Mark, he politely informed me that the last car “I blew up” cost us $2,000 and we had to buy a new (10 year old) car! Mark and I tend to differ on getting things repaired. I told Freddy he needed to talk to me regarding parts, etc., not Mark! Since I’m usually the one that gets stranded, I think if you’re told something needs to be repaired or replace, you do it! Luckily, Bunky and Denise offered to run me home! Muchas Gracias!!! While Bunky and Denise were here, the pool motor started making even a worse noise. We’ve known for quite a while it needed to be replaced. Mark called Morris this morning regarding that. Maybe he’s realizing that putting off the inevitable isn’t worth it! Phone just rang – Freddy…..says the car is ready!!! WOO HOO!!!! What tools would you tell a new knitter she needs to have? A friend is interested in learning to knit socks. I love to knit and was really excited that she wanted to learn too. Too make sure I didn’t forget any necessities, I emailed a couple knitting friends that live in the states. to it right away, and VOILA! – stitches are no longer on your needles…this stops that! A small spiral notebook to keep notes in of the project you’re working on. If any other knitters out in Yarn Land can think of a few more items, or accessories, don’t hesitate to drop me a line. All of the above items can be found at KnitPicks.com – except for one – highlighter tape, which can be found at other websites or even on ebay. A few other websites I lurk around are JimmyBeansWool.com and SimplySockYarn.com – for you knitters outside of the U.S., these two websites ship Internationally. I love websites that ship Internationally!!! Pura Vida from Costa Rica for now.